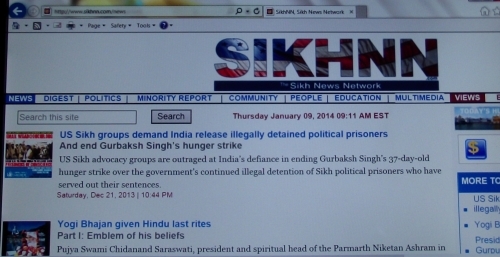 Sikhnn.com ( Sikh News Network) offers outstanding Sikh journalism. I made a $250.00 donation & I encourage all to do the same. The first image that was discovered (right) shows Yogi Bhajan’s wife, Inderjit Kaur Puri, two sons, Ranbir Singh Bhai and Kulbir Singh Puri, daughter, Kamaljit Kaur Kohli, and some of his followers sitting in front of Yogi Bhajan’s garlanded photograph with the swami leading the puja. Although Sikhs believe ashes can be spread anywhere, it is the symbolic combination of Hindu last rites puja with ash immersion in the Ganges that has elevated the significance of this event among Sikhs. And because Yogi Bhajan and his family had previously been to Parmarth and known the swami for decades, and because his followers regularly participated in pujas, artis, havans and yoga festivals at this ashram - even now - this image of his Hindu last rites at Parmarth has become emblematic of Yogi Bhajan’s beliefs and teachings, which Sikhs consider to be heretical. The obscure image of Yogi Bhajan’s Hindu last rites puja was first published in a 2005 article, ‘Harbhajan Singh Yogi Asleat’ (The Reality of Harbhajan Singh Yogi), on the Sikhmarg.com Web site. It was from shortly after Yogi Bhajan’s death, said Gurcharan Singh Jeonwala, author of the article and television commentator from Toronto. He did not know at the time where the image came form or that it was from the last rites puja.